Package: 4 Pcs Plant Hangers. Pot and plant are not included. Due to the nature of handmade items, each plant hanger is individual and there may be slight variations from one to another. TIMEYARD is a registered trademark, we offer a width range of macrame hanging planters in modern, minimalistic style with a dash of boho dream, attention to detail is always our priority and all of our products are professional manufacturing and sole selling. Please feel free to message us if you have any questions - we would be happy to assist! This plant hanger set includes four plant hangers each one in a different design. Each plant hanger when sold individually costs from 9.99-13.99USD. This set will save you about 30USD. 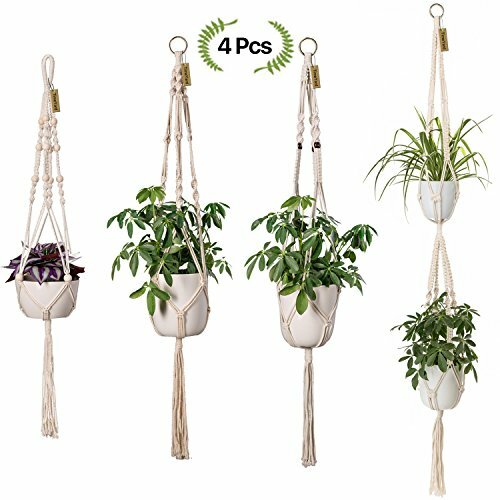 Simple, yet meticulously handcrafted, these macrame plant hangers knotted from high quality cotton rope and hang with diffrent length from 37" to 67" . The collection of indoor plant hangers can fit a variety of pots like ceramic pots, metal pots, plastic pots, glass pots, etc. In the pictures, these plant hanger holders are shown with a 6" diameter pot and a 8" diameter pot. * Plants and pots not included. These hanging plant holders are versatile, such as space saver and home decor. They provide a beautiful way to display your plants that will highlight your greenery, and bring a boho element to your home decor. These sturdy pot holders are ready to hang by your bay window, patio door, curtain rod, in your home or on your porch. Great for indoor and outdoor use. It's easy to hang from a hook in the ceiling or against a wall like a wall hanging. A macrame is the perfect addition to your decor, adding instantly warmth and texture to any room of your house! And Using natural materials giving a minimalist feel and creating a relaxed feel in the room. Perfect for housewarming or unique gift.